Chris Kilham has been called the “Indiana Jones of natural medicine” and the “medicine hunter”. He is an ethnobotanist and has researched medicinal plants in over 30 countries. He travels, writes, studies, and makes appearances on television to help people understand the healing powers of plants. While it seems he may be in the game to brand natural plant medicines, working for Naturex, one of the largest botanical extraction companies in the world, he does have some worthwhile information to share – especially regarding anti-aging herbs. 1. 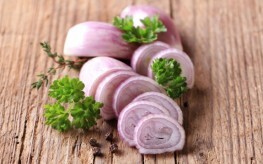 Red Onion – Kilham suggests eating these over yellow onions because they have less sulphur. But both varieties have antioxidants like quercetin and kaempferol, which fight cancer and inflammation, and boost immune function. They can also lower your “bad” cholesterol and help reduce your risk of stroke and heart attack. 2. Holy Basil – This plant is also known as tulsi. An antibacterial, antifungal, and anti-inflammatory plant that has been used to fight cancer and prevent diabetes, holy basil has long been heralded in the ancient Indian ayurvedic medicine. It’s slightly peppery and is a good addition to stir-fry and spicy soups. 3. Reishi mushooms – Studies have shown these little mushrooms to be effective at boosting your immune system and fighting cancer. They are known as the “mushrooms of immortality” and can be found dried in supermarkets or Chinese grocery stores. They are good in soups or made into a tea. 4. Coffee – Two or more cups of coffee each day is said to protect against heart disease, respiratory problems and diabetes, according to Kilham. Four or more cups (if you can handle it) might reduce your risk of stroke and infections. Check out some other awesome coffee health benefits. 5. Turmeric – Containing curcumin, turmeric is a powerful root that can boost cardiovascular function, enhance your immune system and improve brain function. Because of its superior anti-inflammatory properties, it can also be used as a pain reliever. It’s the curcumin within that’s responsible for all of these benefits. Cook with it or take it as a supplement. Singing – Ok, this isn’t an herb, but singing and chanting on a daily basis can reduce stress and exercise the lungs, heart, back muscles, and abs. Kilham suggest making time for this age-old practice each day. Great information about herbs if you learn more about herbal incense then check out herb411.. If you want to shield your skin from harmful pollutants that clog our air, add products full of antioxidants into your daily regimen. Look for lotions that utilize the power of green tea, coffeeberry or pomegranate. These ingredients protect against the negative effects that pollution and sun exposure have on our skin. That's the very pleasant mail you have distributed with us. I actually like it. delight keep distributing more and more information.